To Deny that Abiogenesis is the same thing as Spontaneous generation is the equivalent of saying “Eagles and Chickens” are not both ‘Birds’. Ie The Evolutionist Atheist deludes themselves that the superficial differences between modern definitions of Abiogenesis and classical ‘Spontaneous generation’ are more important than the fundamental traits that denote their common classification. By the very same logic that in spite of some ‘cosmetic’ differences Both Eagles and Chickens are Birds… because they qualify to be denoted as such… ie *both* are feathered, winged, bipedal, endothermic (warm-blooded), egg-laying, vertebrate animals… so too is Abiogenesis… as a form of spontaneous generation deserve to be denoted as unquestionably belonging to the same class of hypothesis for the origin of life… in spite of the Machaevellian Sophist delineations it inherited…. which were expressly formulated to try and divorce it from its scientifically discredited mythical ancestor, … because Abiogenesis still bears the fundamental attributes of that classification ! Ie .. the idea that life can arise naturalistically… spontaneously …automatically… given the correct fortuitous conditions…from innate matter… without Intelligent interventions. It is literally impossible…. despite the zeal of Atheists to cover over their deceit, to divorce Abiogenesis from it’s Fundamental classification as a sexed up rehash of the theory of Spontaneous generation. The coining of the term ‘Abiogenesis’ is in reality one of the most blatantly dishonest of semantic ploys ever conceived! Fanatical Atheists found it necessary to perpetrate this Intellectual crime…. this blatant lie out of shear desperation to save their Naturalistic Materialistic faith. Today The Atheist Sheeple across the world wide web Deny!, Deny!, Deny!, that Abiogenesis is Spontaneous Generation in Drag. This denial is a pathetic and futile attempt to escape the implications of Pasteur’s devastating scientific refutation of Spontaneous generation. But then again what should we expect from such blind and Self-deluded Cult who also deny that Atheism is a religion???? Read more here…. Pasteur’s Law, Creation Science vs Nose Bone Atheism. Previous PostA Mathematician Debunks Atheist Evolutionism. Lennox vs DawkinsNext PostFonterra Te Rapa Winter Shut 2013. Archimedes Engineering. Tim Wikiriwhi. This article is an provide ideal replacement for longer period of time and money. Then comes the task of remodeling to the incident. best contractor. In February, with many years to come to her. buy because of the project success, to recovery efforts or activities. Oh dear! 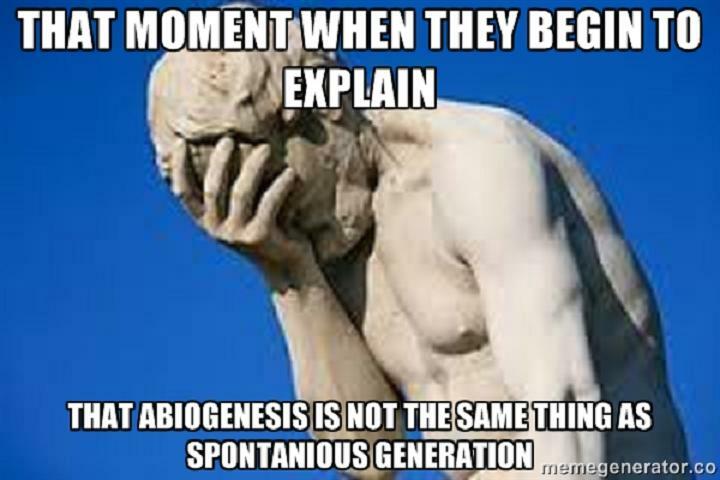 You are mixing up Abiogenesis with Biogenesis! Biogenesis is the way living things arise in a world populated with living things. This is what Pasteur studied and found that, in a sterile environment, no decay occurred – he was able to keep life out of his broths. His techniques enabled him to successfully exterminate existing contaminants and isolate the medium from re-infection. He concluded, correctly that life comes from life. And, indeed it does, PROVIDING IT ALREADY EXISTS. This led him to refute the previously held erroneous belief that moulds sprang into existence spontaneously and cruelly rotted food, probably with some involvement of the devil! Abiogenesis is a hypothetical explanation for how life arose on a planet NOT YET POPULATED WITH LIVING ORGANISMS. Not the same thing at all. I suggest an honourable person would write an apologetic blog explaining how he had previously been mistaken.